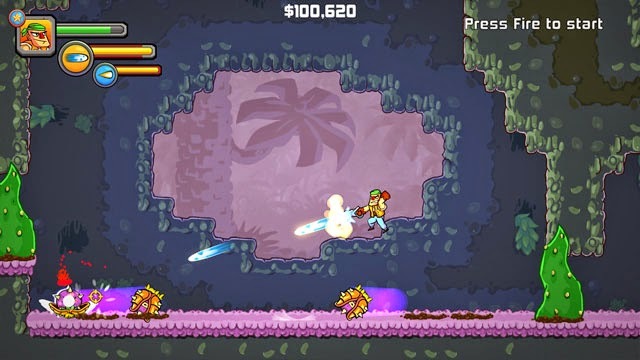 Greedy Guns, from developer Tio Atum, is an action platformer inspired by fast-paced high action games such as Gunstar Heroes and Contra, combined with Metroidvania exploration elements. Players may go alone or team up with another player in 2P co-op to blast away baddies on alien planets. Players are able to move and aim independently with full 360 degree control of their shooting, allowing for shooting while dodging, fast strafing, and the tried-and-true method of running away and screaming while shooting at the bad guys running up behind you. Explosions? Check. Double jump? Check. Enemies bursting into piles of spinning gold coins when they are destroyed? Checkaroonie. The game is now available for PC, Mac, and Linux via Steam. Check our coverage here.